Dette er faktisk en soloppgang fra tidligere i uken! I never tire of shooting pictures of the sky with an incredible mix of intergrating colors that never seem to repeat itself? But, of course, you may get tired of seeing these pictures from me? But – when it comes right down to it, – it’s my hobby, and it’s the only one I’ve got for the time being! 🙂 So – please fasten your seat belts! Here comes another sun-up from some time earlier this week! 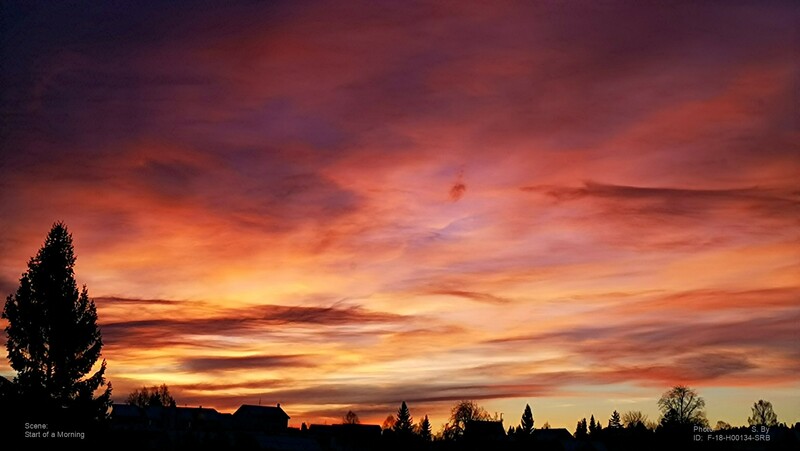 This entry was posted in BUSKERUD and tagged bilder, colors, farger, foto, nature, Norge, Noruega, Norvège, Norway, Norwegen, photo, pictures, SeeNorway, Soloppgang, sun-up. Bookmark the permalink. Love the beauty.Love the way you had your POV.Love the Country man.I wish I were born there.Love the people.So friendly.No where I felt lonely.Oh ! Nature’s bounty and blessings. It was, and thank you! Your sunsets and sunrises are so spectacular, they are worth shooting every day. We can never compete here in London! Good to hear! My health is hampering me a bit moving around into mountain territory these days. I never tire of these photos. They’re gorgeous. Soon these (and a few macro shots from flowers) are what to be expected from me. Time goes bye, you know! Absolutely beautiful, I never get tired of photos like this! Keep showing them please!